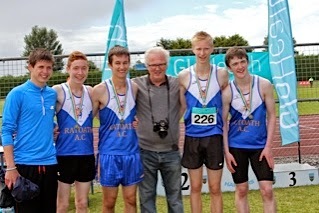 The National relays took place last Saturday at Tullamore Harriers, with over 1000 athlete’s competing in the u12-19 age groups the competition was fierce and 8 National records were broken on the day. We had 5 teams entered from the club but unfortunately our u14 boy’s team had to pull out due to illness. The u18 boys took to the track first in the morning session in the 4 x 400m relay, the team of Ciaran McCarty, Eoin Clayton, Peter Kilgannon and Philip Marron put in a terrific run clocking a time of 3:36.95, the standard this year was extremely high and the lads just finished outside the medals in 4th place, their time would have being good enough for gold the previous year. They had however the consolation prize of setting a new senior and junior men’s club record smashing the previous one by over 7 seconds. The afternoon session seen our u12 girls, u14 girls and u17 boys in action, The u17 boys team were first on the track, the team of Brian Kiernan, Eoin Clayton, Philip Marron and Peter Kilgannon were in no mood to settle for anything less than a medal in the 4 x 400m relay. Brian Kiernan got the lads off to a great start and with a very strong run and a slight lead over the chasing pack handed over to Philip Marron, Philip held the lead on the 2nd leg and handed over to Eoin, Eoin ran a very steady third leg and although passed he remained very close behind the leader for the handover to Peter Kilgannon. Peter kept his cool and tucked in behind the leader and with 200m to go went to the front, the Leevale athlete tried to respond but was unable to over haul Peter who finished strongly taking Gold and the National title. 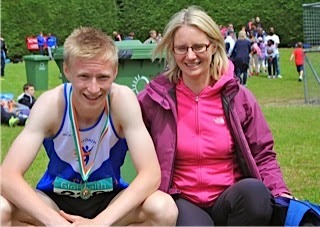 The lad’s time of 3:38.57 was only 1 second off the National record. The U12 and 14 girls were up next, with 17 teams competing in the u12 and 14 teams in the u14 relay the competition for places in the final was going to be vicious. The u12 girls team of Aimee Doherty, Lili O Connor, Emma O Connell, Aoife Rutherford and Ella Healy were drawn in heat 3 and with a very good run and smooth change overs they finished 1st in a time of 57s qualifying them for the final as 3rd fastest seeds. The u14 girls team of Emma Coroner, Ivie Okome, Lara Power and Aine Cooney competed in heat 1 and had a very good run to finish 2nd in a time of 52.99s, again qualifying for their final as 3rd fastest seeds. The finals were an intense affair, the u12 girls ran their hearts out and finished 2nd to a very powerful Blackrock team who also broke the National record, our girl’s time of 56.45 smashed their Leinster winning time of 58.88s. The u14 girls ran a great final and were unbelievably unfortunate to finish 4th in the final, the girls were 7 thousands of a second away from the bronze. Although they were understandably gutted on the day their great run and time of 52.87s should give them great confidence for the future. Thanks to all athletes who put in a great effort in training over the past number of weeks.